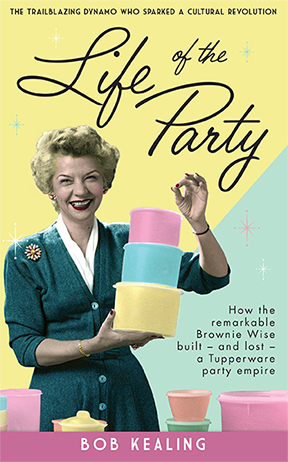 A woman ahead of her time, Brownie Wise converted postwar optimism into a record-breaking sales engine powered by ordinary housewives – and changed their lives forever. Having started her own successful business after divorcing her alcoholic husband, the plucky Southern single mum bristled at suggestions that management was ‘no place for a woman’. Then she caught the eye of Tupperware inventor Earl Tupper, whose plastic containers were collecting dust on store shelves. The now legendary Tupperware Party that Wise popularised, a masterclass in the soft sell, drove Tupperware’s sales to stratospheric heights. It also gave poorly educated and economically invisible postwar women an acceptable way to earn money for their families – and to be rewarded for their efforts. With the people skills of Dale Carnegie and the looks of Doris Day, Brownie Wise was a media megastar, and in 1954 she became the first woman to appear on the cover of Business Week. Then, at the height of her success, Earl Tupper fired her, wrote her out of Tupperware’s success story and left her with a pittance. He walked away with a fortune and she disappeared – until now. Originally published as Tupperware Unsealed, this riveting updated story puts this trailblazing dynamo back in the spotlight where she belongs.